Brexit could begin in two months if a campaign to halt Article 50 doesn’t get a move on. It tells us everything we need to know about the perilous state of our country. On the day that a major UK property investment fund announced it was ceasing trading due to Brexit fears, Andrea Leadsom MP electrified the campaign for the Conservative leadership by announcing she would invoke Article 50 and start the brexit process immediately if she won. Politics and economics may now be on a collision course. Leadsom trails Theresa May in nominations by Conservative MPs but is rapidly becoming the most likely candidate to join the Home Secretary on the ballot paper that goes to Party members. If that does happen most observers seem to agree that Leadsom could run May very close and could even win. The Tory grassroots are made up of many fanatical brexiteers who may well be seduced by Leadsom’s eagerness to get on with pulling the UK out of the EU when they compare it to May’s much more cautious approach. In fact, a survey of readers of the popular Conservative Home website found Leadsom with huge momentum shooting up from 13% support to 38% support in six days and now just ahead of May. This should send a chill down the spine of everyone who voted for Remain as well as the growing number of Leave voters who are showing some regret. Leadsom may sound and look like a loveable aunt but she is now the most dangerous politician in Britain. She clearly plans to ignore the closeness of the Referendum vote, ignore the popular support for an election, ignore the growing evidence of the damage brexit will do to jobs and businesses and ignore the threat to the constitutional integrity of the UK by pressing ahead with the insanity of rapid brexit. Just as worryingly she is ignoring the fact that such a move will only heighten the deep political, social and economic divisions that seem to be cutting ever deeper into the country’s flesh. In normal times we might look to the main opposition party to fight back against these damaging plans. We might hold out hope, for example, that in a tight Parliament, the Opposition could persuade some wiser Tory MPs to rebel against plans to invoke Article 50 before September is over. But the Labour Party is currently in a godawful mess and may well go into the Autumn in a state of leaderless collapse and irreconcilable division. Under these conditions the burden falls to citizens outside Parliament to take the fight to the Government. It is obvious where that fight has to come from. 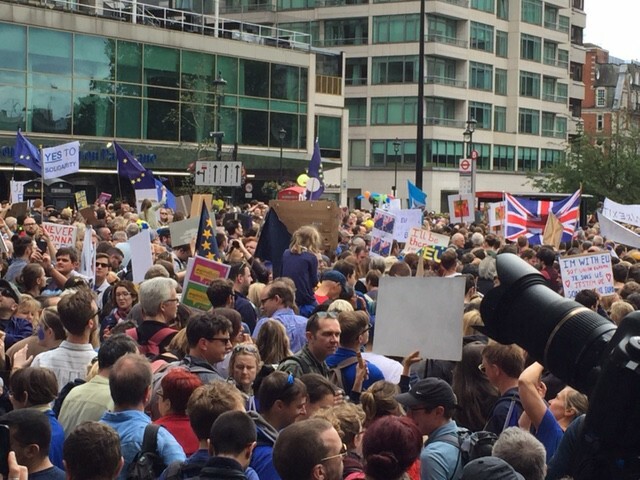 The March for Europe on Saturday was a massive success attracting far bigger numbers than were expected. The people who attended the protest, the online network created by it and the sense of solidarity it inspired must now be used to mobilise a campaign to prevent Article 50 being invoked. That means letter-writing and lobbying of MPs, more petitions, more protests, stunts — all the usual tactics used by campaigns over the years. But the important thing is that the large number of goals that have sprung up since the vote must now be put on hold to focus all energies on that one objective. The reason is simple. If Article 50 is invoked there is no going back. Brexit is underway and the UK only has two years to develop a new partnership with the EU. If after that time, a partnership has not been agreed, the UK is cut adrift from the EU without any deal. Precisely what many of the more fanatical brexiteers want which explains why Leadsom is unfazed by invoking Article 50 so rapidly. And there is no time to wait and see if Leadsom is indeed elected. By then it could be too late. A new PM who has pledged publicly to invoke Article 50, facing an historically weak Opposition and enjoying a honeymoon period with Tory MPs keen to reunite after a bruising contest might well be able to press the nuclear brexit button within days of her election on 9th September. My new book ‘Small is Powerful: Why the era of big business, big government and big culture is over’ can be ordered here. You can follow me on Twitter here.